George Pellietier has been chosen by Random.org. to win the tickets. Congratulations George!!!! Blue Man Group is awesome. I saw the show several years ago with friends. For Father’s Day we’re taking the family for the first time! It’s going to be a blast, the kids are going to be in awe! 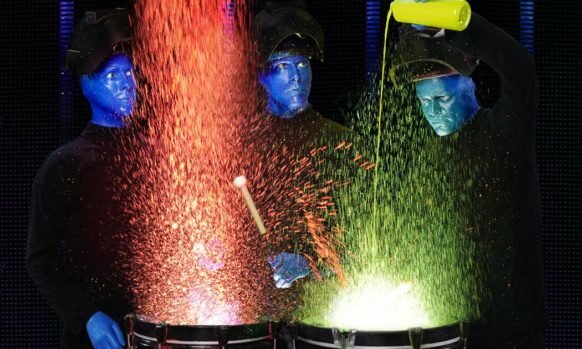 Thanks to the Blue Man Group-they have offered our readers another family 4 pack to give away! How terrific is that! The giveaway will begin now and run through next Wednesday evening. We will draw a winner through random number generator. Important to note that these winning tickets are for shows after April 30th! If you’re looking to see the show over April vacation, please read our post about saving $25 a ticket HERE. This giveaway if very easy to enter. Your entries will be from comments you leave on our blog. Comments are shown on our end first and are set for us to approve them before they are shown on the posts. So don’t worry if you don’t see them right away. 3- Leave a comment on any other post on our site. The comments generate on the backside of our blog. The more comments you leave, the more chances your number will be chosen. Good luck! The winner will be emailed Wednesday evening with a deadline date to claim prize. If winner does not respond in time, a new winner will be chosen. Thanks so much Blue Man Group for giving us another great giveaway pack! You’re the best! Liked your FB page! Thank you! Liked and shared post! Would love to bring my family! Already have been liking your page Would love to take my teens and hubby to this show since their birthdays are coming up and it’s tough to find fun things the older they get! Liked your page! Love following your page always have tons of activities for my family. I liked your FB page. Thanks! Thank you for the chance to show my family this awesome show! Liked and shared !! We’d love to see this phenomenal show !!!! So exciting. Would love to bring my girls!! My boys would be over the moon to see Blue Man Group! Love Blue Man Group!! I saw them a few years ago with my Dad , before he passed away! Would love to share the show with my kids! One of the Facebook pages I actually like to see coming across the news feed! By the way, I love this blog! Lots of great ideas here! I have liked your page forever! I have shared and written a comment on another post. absolutely love this page and my 8 yo son has been begging me to see blueman group! Liked for a long time!! Thank you! Liked your page a looong time ago!! Always great ideas for things to do! Page is liked! Kids would love this show! WOULD LOVE TO SEE YOU!! Liked your FB page!! Thank you!!! George, I”m emailing you now! Your name was picked through Random.org!!!! Thank you so much. I am so excited to bring my daughters to this amazing show. I can not thank you enough. Liked and shared! Fingers crossed! We would love to see Blue Man Group! Liked and shared thank you! Liked and shared. This is cool! Love Blue Man Group.. Would like the chance for the kids to see them. I saw them years ago+they are Great! Liked and shared! This would be amazing! Shared on facebook for all my friends to try their luck! Liked your page and what you do…. Liked and retweeted on twitter! I am already a follower of your page…Like! Liked and shared would love to take my boys..